Naples, Fl. 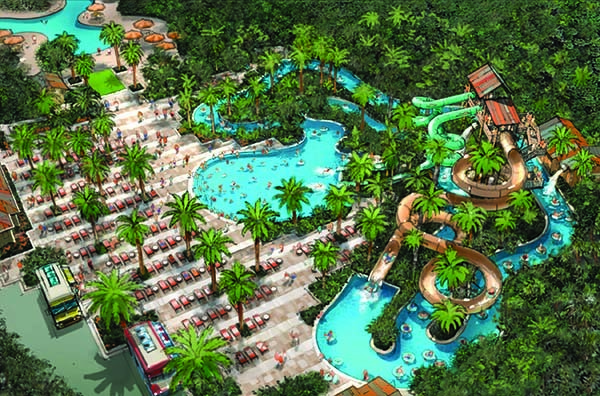 –Manhattan Construction has been awarded the contract for the Amenity Expansion to the pool area of the Hyatt Regency Coconut Point Resort & Spa in Bonita Springs, Florida. The expansion involves developing the adjacent one-acre site to include a lazy river pool wrapping around the project, a themed slide tower mimicking a treehouse, two speed slides and a tube slide and lush landscaping. Also included are dedicated spaces for food trucks to serve guests that will be periodically rotated. “We’re excited to break ground and continue our relationship with Hyatt, helping them to add value and remain a top destination resort in Southwest Florida,” said Manhattan Senior Vice President Gordon Knapp. This is the fourth project Manhattan has contracted for at the Hyatt Regency Coconut Point, said Knapp. Manhattan completed renovations to meeting rooms, renovations to the on-site Tanglewood Restaurant and most recently renovations to the Camp Hyatt childcare facility. Designed by EDSA Architects of Fort Lauderdale, the project will add to the already long list of world-class amenities at the hotel. Knapp anticipates the project to be open in November before the Thanksgiving Holiday. You are currently browsing the Manhattan Construction Group blog archives for March, 2016.